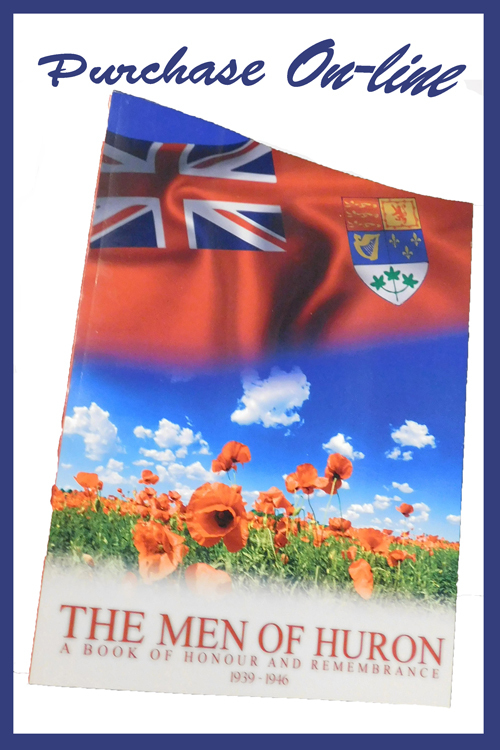 BROTHER: Mr. Harry Evans – Brussels – Ontario. Upon his enlistment, he was assigned to Ontario Central District Depot No. 1 (Active Force). Private Evans was sent to No. 13 Basic Training Camp based in Listowel – Ontario. He is appointed to the rank of Trooper. Trooper Evans qualifies as a Class III driver of wheeled vehicles on April 7, 1943. Trooper Evans on May 8, 1943 qualifies as a Tracked Instructor. In the second half of June 1943 Trooper Evans qualifies as a Class III tank driver. Prior to going overseas Trooper Evans is given leave and he spends this time with his family and friends in the Brussels area of Huron County. Embarkation from Halifax and Canada occurs on October 23, 1943. Trooper Evans arrives in the United Kingdom on October 29, 1943. On November 14, 1943 Trooper Evans moved to No. 1 Canadian Ordnance Reinforcement Unit. He is granted 9 days leave on January 26, 1944. On February 2, 1944 Trooper Evans is sent to No. 29 Governor General’s Horse Guards and it is here he qualifies as Driver / Mechanic Tank “C”. Trooper Evans departs the United Kingdom on July 20, 1944. Trooper Evans received a head wound on August 26, 1944. He suffered a lacerated scalp. He first went to No. 15 Canadian Field Ambulance. On August 27th, he went to No. 5 Canadian Field Dressing Station. From there he was sent to No. 75 British General Hospital located at Bayeux. He was deemed to be fit for air evacuation to England and was discharged on August 29, 1944. It is believed that he was sent to England to see if there was any paralysis or any other damage. November 27, 1944 Trooper Evans is awarded 9 days Privileged Leave with meal allowance on October 10, 1944. November 23, 1944 has him going to No. 3 Canadian Medical Centre. He Embarks from England on January 5, 1945. He arrives in France on January 6, 1945. He is assigned to the 9th Canadian Armoured Corp Reinforcement Regiment. On February 6, 1945 Trooper Evans rejoins the South Alberta Regiment in the field. Operation VERITABLE was the plan to clear the Rhineland and to then push into Germany itself. This began of February 26, 1945 with the objective being the Hochwald Forest and clearing the high ground at Calcar and Udem. The Hochwald Gap proved to be a tough nut and this fight went on until March 4th. Between March 4-9, 1945 was the fight for Veen and it was during this battle where Trooper Evans lost his life. This the last fight for the Division before crossing the Rhine. 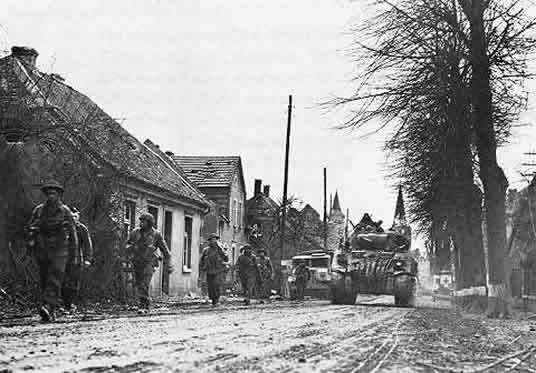 Veen was thought to be lightly defended but on March 7th, as the advance began the Canadians found out this was not the case as they met very heavy fire. The enemy was placing much attention on the Regiment. 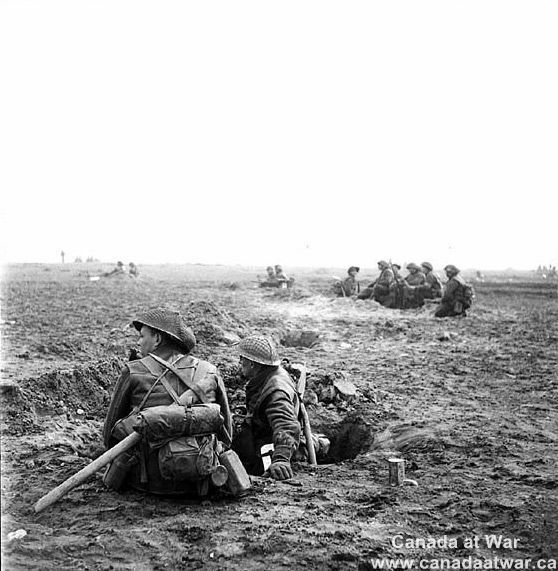 Advancing was slowed due to the heavy artillery and mortar fire but as well because of the cratering in the road, minefields and increased enemy resistance held the South Albertas up short of Veen. The town proved to be a serious obstacle as the houses had been turned into armoured pill box with concrete walls and slits for machine gun fire. The cellars were divided up into concrete boxes where the enemy would wait and then make their suicidal move onto the Canadians. On March 9, 1945, the town of Veen fell. a) The Regiment as a Squadron had 19 tanks. 3 at Headquarters and the 4 Troops each having 4 tanks. 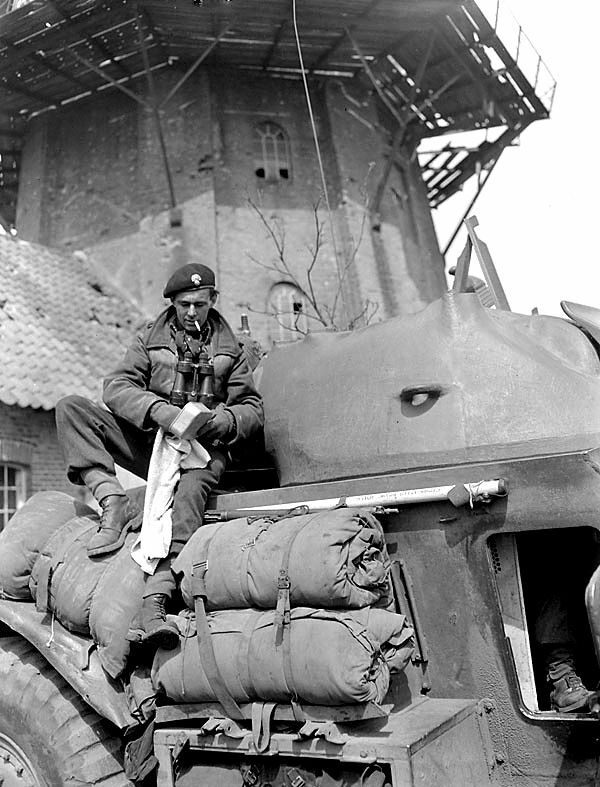 b) The Sherman tank was the tank of choice for the Royal Canadian Armoured Corps because of the mobility it possessed. However, it was not capable of absorbing the heavy shells from the enemy tanks and anti tank guns. The range of the enemy tanks was 4X that of the Sherman. c) The battle on March 6th at Sonsbeck / Veen was bitter, it was fierce and it was bloody and all the while the enemy resistance was fanatical to the extreme. 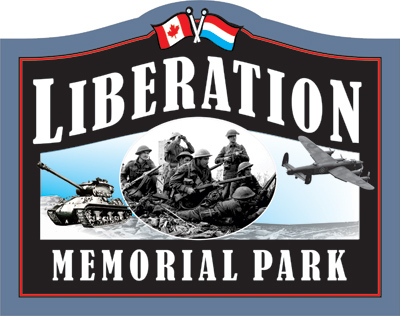 d) On March 7th, the South Alberta Regiment were south of Kirjel, and as the day progressed “A” Squadron would send 2 troops of tanks forward toward Veen with additional troops to move if needed. e) “C“ Squadron was to remain stationary and shell the town of Veen until 4 pm. f) “B” Squadron was to shell Pidgeon and March. g) When the infantry was to go in the fire from the armour would be lifted and then concentrated on the woods of Keaton North. “A” Squadron would then send 2 Troops with the infantry (Algonquin Regiment) on the right and one Troop with the infantry on the left. h) It did not take the Regiment very long to come under very heavy enemy artillery and mortar and stopped both the armour and the infantry. The shelling was coming from the east of March and already 3 Troop had lost a tank and also had to contend with the crossroads being mined plus they had to push a booby - trapped vehicle out of the way. One tank was in flames and another was immobilized. i) 1 Troop arrived at 7:30 pm with two tanks and the position was formed up with the assistance of the Infantry at Pidgeon. Now, from the edge of the woods, an enemy anti tank gun had begun firing and had pinned down the two tanks and they were unable to maneuver to face this threat. Even with the support of the artillery this gun could not be altogether silenced. Later 4 Troop sent in two tanks as support. j) Lieutenant Fraser of the Algonquin Regiment tried to eliminate an enemy machine gun position and was killed in his attempt. Trooper Evans left his tank, rushed to aid Lieutenant Fraser, picked him up and carried him to the cover of a farmhouse. Trooper Evans had no way of knowing his comrade was already dead. Just as he got to the house and into the kitchen an enemy mortar shell exploded in the nearby orchard and a fragment flew through the window and struck him in the head. Trooper Evans died immediately. k) Veen finally fell on March 9, 1945.
l) On March 10, 1945, Padre Wilcox entered the farmhouse in search of Trooper Evans and found him lying across a heap of enemy cartridges on the floor. m) The burial part gathered his personal belongings and these were sent back to his family in Canada. n) Padre Wilcox would eventually write a personal letter to the family of Trooper Evans as he did with every man who fell. Trooper Evans was originally buried in a temporary military cemetery located at Sonsbeck – Germany. Plot 1 – Row D – Grave 5. Mrs. Evans was named Executrix of his Estate by her son Trooper Evans. Mrs. Evans received a letter dated March 31, 1945 from Major – General Walford per the Adjutant General expressing condolences and sympathy regarding the loss of her son Trooper Evans. The following items of Trooper Evans were returned to the family….. The Evans family receives a letter dated December 6, 1947 and enclosed is a photograph of where Trooper Evans is resting. Trooper Evans has $50.00 in Victory Bonds. The War Service Gratuity for Trooper Evans in $383.11. His last pay is $208.96.